Acura is taking in-car music to a rather unusual place with a campaign that launched this month, aimed at getting Millennials to pay attention. While brands like to make playlists and sponsor them on music channels, Acura is creating a playlist explicitly for the ILX sedan, intended to embody the experience of the transmission. 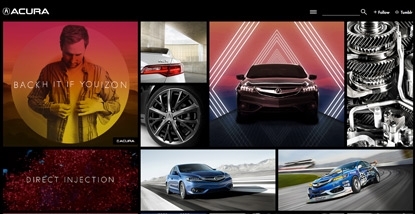 The automaker -- Honda Motor's luxury division -- has launched a social media-based promotion around the music, which comprises eight tracks by as many emerging musicians. The effort extends ongoing digital efforts to tout the ILX Sport to younger consumers, including a recently launched social-meme campaign tied to NCAA hoops. For the new element of the campaign, each of the musicians will create custom music for the car. Why eight? Each song is designed to match one of the the ILX’s 8-speed Dual Clutch Transmission gears. As the driver moves up through the gears and increases speed, the songs also increase in velocity and intensity, not in real life, but in a shareable video. The music lives on SoundCloud and is streamed through Acura's Tumblr, per a spokesperson. The player/playlist on the Tumblr page is streaming tracks from the artists’ own SoundCloud pages to leverage their following. The music is intended to give an aural impression of the experience of driving the ILX to create a halo effect for Millennials “by aligning Acura with one of the most innovative music sharing platforms out there,” she says. “We looked for emerging artists within the dance, electronic and indie space that are on top of music and industry trends.” The final mash-up video of the eight songs -- showing running footage of the car, with the music changing as the driver shifts -- will be posted later this week, while the Tumblr site will be up for the next couple of months. She tells Marketing Daily that Acura’s social media team reports seven million impressions for the Tumblr post on the playlist; and 2,000 re-blogs of the post. With each of the eight artists sharing the program across their social channels, the program reaches more than 250,000 social media followers.